A long standing client with a brilliant new design. 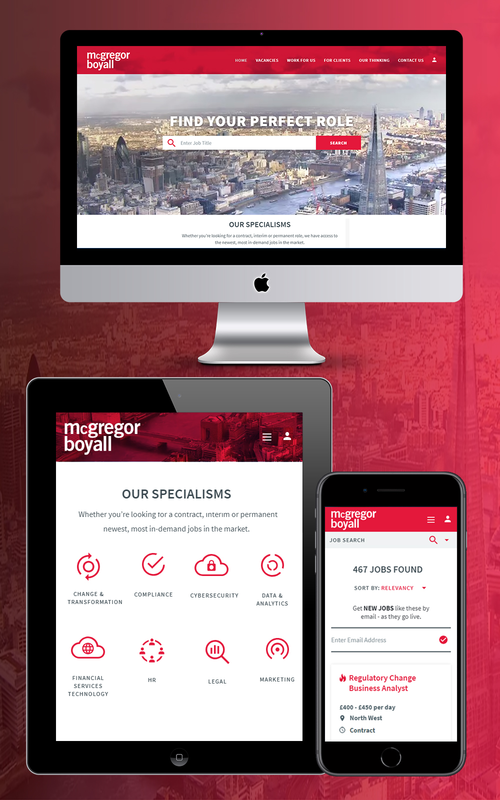 McGregor Boyall is a shining example of a client who is a delight to work with in partnership. We share ideas and learn from each other. They are happy to take the time to really understand things and really think things through …and if this involves a change of direction, to handle that maturely. The site has the benefit of dedicated internal marketing expertise that really owns the project. Broadbean integration to feed jobs from their CRM to the site and huge roster of skilled consultants worldwide, covering many niches. The challenge was to appeal to client and candidates in many sectors whilst projecting a warm and caring ethos. Not always easy for a large organisation. The site holds a wealth of useful free resources, positioning them as trusted industry voices. Video testimonials added to the site appeal and were created with great production values and careful presentation.